Our last raids rewards developer blog left the community asking for bigger and better rewards from raids. Since the last blog, we've decided to offer an additional 9 items. And you had better believe they're big! Increased the Magic defence of all pieces of Elder Armour. Increased the Range Attack of the Twisted Helm from +10 to +15. Increased the Magic damage of the Kodai Wand from 10% to 15%. Defence requirements for Rigour & Augury will be offered separately. Elder armour is a new, top-tier set of melee armour. It requires level 75 Defence to equip and provides bonuses to justify very high requirement. When worn, Elder armour pieces will degrade. If used in combat for a total of 10 hours, they will become unusable and must be recharged with coins. As these armours will cost money to use, we expect them to mostly be seen in use against boss monsters or in high level PvP. The cost of using these armours will mean that many players will choose to opt for the lower tier alternatives, such as bandos, helm of neitiznot or the fighter torso. Elder armour will be extremely hard to get. As a very rare reward from raids, we expect the price tag for a full set to be in the hundreds of millions. This is not your everyday kind of gear and will truly justify sitting at tier 75. Since we showed the proposed Elder armour on stream last week, we received a lot of feedback suggesting to take the stats down in some areas. To address this feedback we have reduced the strength bonus of the body and legs to match that of bandos chestplate and tassets. The Elder maul is a slow, hard-hitting and accurate crush weapon. It requires level 75 Attack and Strength to use. The Elder maul does not have a special attack and hits at the same rate as a godsword. Since the last developer blog we opened a beta which included the Elder maul. After the community got their hands on it, the overwhelming response was that it was not strong enough to compete with other weapons. To improve the maul, we have given it quite a substantial increase in its crush accuracy. It has been taken up from +120 to +135. This makes the maul slightly more accurate with crush than a godsword is with slash. With the introduction of elder and twisted armours, we have revisited the Kodai robes to make them stand up to the level 75 requirements we wish to give them. We have completely re-worked Kodai robes for this blog. Kodai robes now require level 75 Magic and Defence, providing substantial bonuses for both. When worn, Kodai robes will degrade. If used in combat for a total of 10 hours, they will become unusable and must be recharged with coins. The substantial buff to Kodai robes will justify making the much rarer, and much more valuable, as a reward from raids. Ahrim's will remain the go-to option for most players, with very high-end players choosing to opt for Kodai. Previously named the Elder wand, the Kodai wand is a high level magic weapon created by using an Kodai enchantment on a master wand. Kodai enchantments are a drop received from raids. The Kodai wand requires level 75 magic to equip. In addition to the stats shown above, the Kodai wand both acts as a water staff and provides a 15% chance of negating rune costs when casting a spell. It can be used to autocast ancient magicks. Since the previous developer blog we have received a fair amount of feedback regarding the strength of the Kodai wand, with the primary concern being the wand not being strong enough. As a result, we've increased the magic damage boost of the wand from 5% to 10%. Alongside its other effects and stats, this improvement ensures the wand will be a very useful weapon and will justify its inevitably large price tag. Twisted armour is a set of very strong Ranged armour which requires both level 75 Ranged and Defence to use. 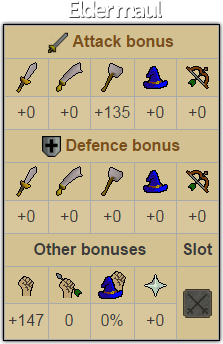 Twisted would be the first set of armour in the game to provide Ranged strength bonus. When worn, Twisted armour pieces will degrade. If used in combat for a total of 10 hours, they will become unusable and must be recharged with coins. Much like the other raids rewards armours, Twisted will truly live up to being on a new tier for Ranged armours. Armadyl will remain the go-to for most players, with Twisted being an option for high level players in high-profit scenarios. Dragon thrownaxes provide +36 Ranged attack and +47 Ranged strength. The special attack of the dragon thrownaxe improves accuracy by 25% and guarantees that you will attack on the next game tick. This special attack costs 25% special attack energy. The special attack could be used to attack several times in quick succession with improved accuracy. Unlike the granite maul special attack, it would not be possible to use all of these special attack hits at once. You would have to correctly time your use of the special attacks, and would only be able to hit once per game tick. Dragon thrownaxes are consumed when they are thrown using the special attack. For years we have seen request after request from Old School players asking us to bring the dragon sword into the game. The time has come, and we'd like to offer it as a reward from raids! The special attack of the dragon sword has one of two effects. If your target is protecting from melee, the special attack ignores this for one attack. If they are not, it hits with 25% increased accuracy and damage. The special attack costs 40% special attack energy. For some time we have discussed the possibility of additions to the Old School prayer book. Prayers such as Rigour and Augury have come up regularly in those discussions, and now we would like to offer a few new prayers unlocked with raid rewards. The forgotten prayers are unlocked with a tradeable scroll dropped as a reward from raids. When the scroll is read, you will be given a choice of learning one of three prayers. After one prayer is learnt, the scroll crumbles to dust. 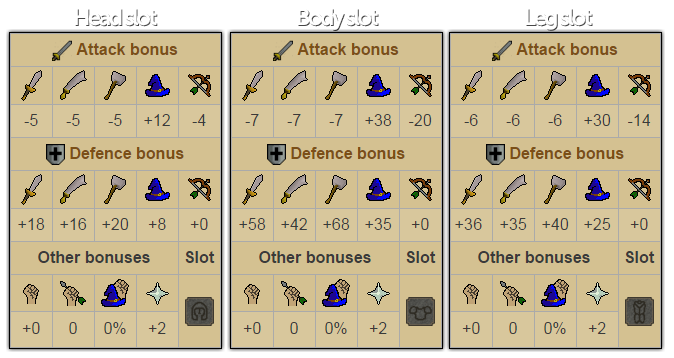 There has been some discussion regarding whether or not Rigour & Augury should require 70 defence, as Piety does. When polled we shall offer the prayers and a defence requirement for them separately. A poll will be on the way for the above raids rewards in a couple of weeks time. We're still open to making further changes, but we need your feedback for that to happen. If you have any thoughts on the raids armours, please let us know. Thanks for buffing the maul! I really hope the new armour passes,it looks great and it would be a damn shame if raids come out without them. Raids are high end content so they NEED BIS armours. Oblivion - OSRS's #1 PvM & Elite Clan! Also, please do another Goblin Invasion event, they were fun! Agreed. The Armor and Weapons need to be highly sought after. There's no point in having the traditional end-game content reward obsolete gear.